Heat the first three ingredients in a saucepan until the sugar is dissolved. Remove the saucepan from the heat and let it cool until it's lukewarm. Sprinkle the yeast on top and let it sit for a minute or so. In a separate bowl, combine all the dry ingredients. Add the liquid ingredients to the dry ingredients and stir til combined. Cover the bowl with a towel and let rest and rise for 2 hours. Preheat oven to 350. On a floured surface, roll out the dough until it's thin, about 1/8 of an inch. Cut the rolled out dough into 4 x 8 inch pieces. Place 2 slices of jalapeno and a piece of sausage down the center of each piece of dough. Fold the short ends over the ends of the sausage pieces and then roll up the sausage roll and place on a rimmed baking sheet covered with parchment paper, seam side down. Put a little water in a bowl with one egg and beat it together. Brush each sausage roll with a little egg wash. Bake until golden brown. 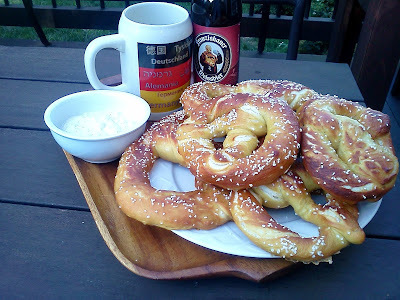 My son Jacob loves these soft pretzels and it's a special treat when I make them. Jacob and my husband, Jeff, polished off the whole batch in less than two hours. They just kept coming back for more. Combine the water, sugar and kosher salt in the bowl of a stand mixer and sprinkle the yeast on top. Allow to sit for 5 minutes or until the mixture begins to foam. Add the flour and butter and, using the dough hook attachment, mix on low speed until well combined. Change to medium speed and knead until the dough is smooth and pulls away from the side of the bowl, approximately 4 to 5 minutes. Remove the dough from the bowl, clean the bowl and then oil it well with vegetable oil. Return the dough to the bowl, cover with plastic wrap and sit in a warm place for approximately 50 to 55 minutes or until the dough has doubled in size. Preheat the oven to 450 degrees F. Line 2 half-sheet pans with parchment paper and lightly brush with the vegetable oil. Set aside. Place the pretzels into the boiling water, 1 by 1, for 30 seconds. Remove them from the water using a large flat spatula. Return to the half sheet pan, brush the top of each pretzel with the beaten egg yolk and water mixture and sprinkle with the pretzel salt. Bake until dark golden brown in color, approximately 12 to 14 minutes. Transfer to a cooling rack for at least 5 minutes before serving with creamy mustard dill dip. Combine all ingredients in a bowl. Chill for an hour and serve with soft pretzels. This dip is also wonderful with fish or as a sandwich spread. There are a few weird things about this recipe, but I love it anyway. First of all, most of the recipes that are similar to this are called “bread”, but it’s really more like cake. Secondly, it’s called “tea” bread, but there’s no tea in it. (Yes, I know it’s because you’re suppose to have it at tea time.) And thirdly, it’s called “French” but the first ingredient is Greek yogurt. So there ya go. It makes no sense, but it’s pretty darn good. This recipe would make great muffins. I look forward to using this recipe as a base and pairing different yogurt and citrus flavors. Vanilla and orange. Coconut and lime. Blueberry and lemon. Honey and lemon. There are so many great Greek yogurt flavors out there, the possibilities are endless! Mix together the yogurt, olive oil, eggs, sugar, vanilla, and lime juice. Stir in the flour, baking powder, baking soda, and salt. Pour into a greased loaf pan. Bake at 350 degrees for 50-60 minutes. Susan's Bread Challenge made me think immediately of this recipe from the Cowgirl Chef. You can follow the link to the recipe or you can go get your Cowgirl Chef cookbook. I love the cookbook because I've decided to go crazy and cook every single recipe in the book and with every page I turn I've added flour or batter or olive oil or something to the page! Will this book attract ants? Who cares! It's a GREAT BOOK! I really, really love putting a tablecloth on the kitchen island. When I'm done, I shake it outside (feed the birds), and toss it in the washer (laundry is my favorite - way better than cleaning counters). I was supposed to roll this out in the shape a football. I think this was fine, don't you? Look! I had the rolling pin out, all ready to...roll. But since I was supposed to roll the dough right on the pan, I used this handy roller because it fits inside my rimmed baking sheets and the giant roller doesn't. I got this one from a Pampered Chef party when we lived in Flower Mound from our neighbor who was a PC rep. LOOK! They still sell them! Yes, the disposable gloves have permanent residence in the kitchen - right in the drawer with the wraps and ziplocs and toothpicks. Where do you store your toothpicks? They really don't have a perfect place in the kitchen, do they? Right out of the oven!!!! Smells amazing! I baked 1/4 of the dough. The rest is going in the freezer (sans mushroom tapenade). I'm thinking up what other things I might add to these the next time I make them. Which could possibly occur before the dough even freezes. P.S. I made the rest of that dough! Yes, I did! And I added NOTHING to it. No Kalamata olives and no mushroom tapenade. And it was fantastic! I also baked it a minute or two less, and I liked it better! Try it and tell me what you think! Mix together the flour, sugar, baking powder, salt and shortening with a fork or pastry blender. Stir in the egg and milk until just combined. Carefully fold in the blueberries. Cover the bowl with plastic wrap and let sit for at least 4 hours or overnight. Preheat the oven to 375 degrees. Grease muffin cups or use paper liners. Fill with the muffin mix about 2/3 the way full. Top with a sprinkle of sugar in the raw, if desired. Bake until golden brown, about 25 minutes. Makes 12 medium sized muffins. To prepare the filling:Combine the cream cheese and confectioners’ sugar in a medium bowl and mix well until blended and smooth. Transfer the mixture onto a piece of plastic wrap and shape into a log about 1½-inches in diameter. Smooth the plastic wrap tightly around the log, and reinforce with a piece of foil. Transfer to the freezer and chill until at least slightly firm, at least 2 hours. Preheat the oven to 350˚ F. Line the muffin pans with paper liners. In a medium bowl, combine the flour, cinnamon, nutmeg, cloves, pumpkin pie spice, salt and baking soda; whisk to blend. 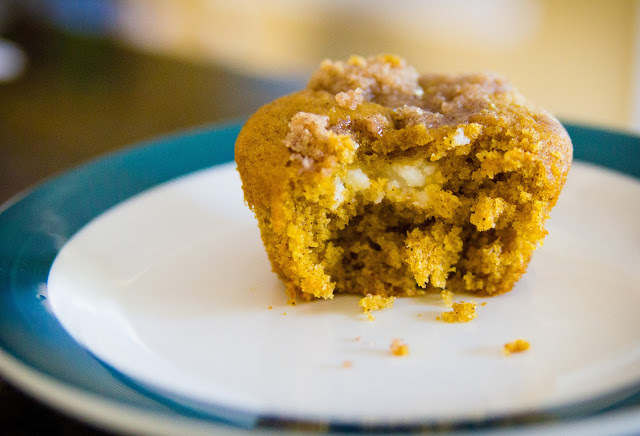 In the bowl of an electric mixer combine the eggs, sugar, pumpkin puree and oil. Mix on medium-low speed until blended. With the mixer on low speed, add the dry ingredients, mixing just until incorporated. To make the topping:Combine the sugar, flour and cinnamon in a small bowl; whisk to blend. Add in the butter pieces and cut into the dry ingredients with a pastry blender or two forks until the mixture is coarse and crumbly. Place in the refrigerator until ready to use. To assemble the muffins:Fill each muffin well with a small amount of batter, just enough to cover the bottom of the liner (1-2 tablespoons). Slice the log of cream cheese filling into 24 equal pieces. 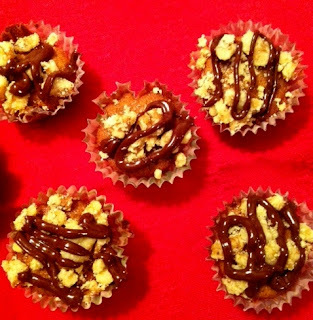 Place a slice of the cream cheese mixture into each muffin well. Divide the remaining batter between the muffin cups, placing on top of the cream cheese to cover completely. Sprinkle a small amount of the topping mixture over each muffin. Bake for 20-25 minutes. Transfer to a wire rack and let cool completely before serving. My grandmother used to make Strawberry Bread. I loved her recipe but I wanted something a little bit different, and this is what I came up with. While this isn't her recipe, she was definitely the inspiration for it! I made this in the fall when strawberries were out of season, so I used frozen strawberries. I plan to try it again in the spring with fresh strawberries. Preheat the oven to 350. Chop the strawberries and set aside. In a mixing bowl, sift together the flour, sugar, salt and baking powder and set aside. Whisk the egg in a measuring cup and add enough milk to make 1 cup. Whisk together the oil, egg and milk, and vanilla bean seeds. Add to dry ingredients and mix until combined. Gently fold in the chopped strawberries. Bake for 45 minutes to 1 hour, or until done and top is golden. Cool completely. For the glaze, put 1/4 cup of strawberries and 2 tablespoons of cream in a food processor and pulse until pureed. You will only need 3 teaspoons of this mixture. You can freeze the rest and add it to your next smoothie! In a small mixing bowl, measure out 1 cup of powdered sugar, vanilla bean seeds, 3 teaspoons of strawberry puree and 3 - 4 teaspoons cream. Mix well and drizzle over the cooled loaf. I love to bake bread. You could say I’m slightly dough obsessed. My husband would say it’s more like I’m possessed. Since this is an Oktoberfest challenge, rye bread immediately came to mind. Back in the day, I worked at a bakery that sold an onion rye that was to die for. It was my husband’s preferred snack with a cold beer. Screw peanuts, Doritos and the like. Jeff liked a hunk of fragrant onion rye and a couple wedges of cheese with his beer. Jeff happened to be in Germany when I made this bread. So my co-workers got to devour a couple of loaves. 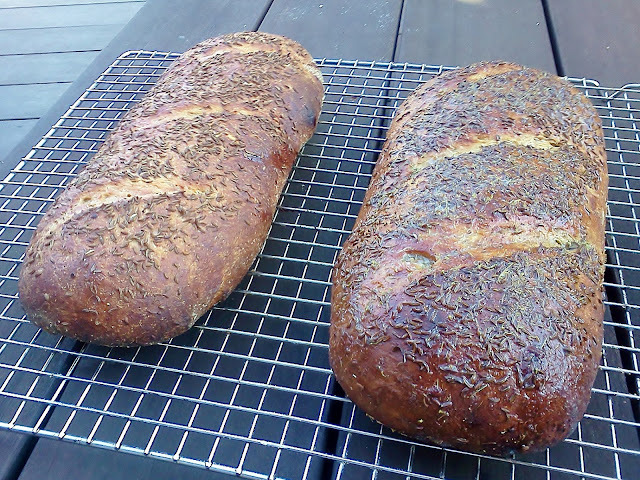 Our friends at Marx Foods sent us a care package to play around with, so one of the loaves got brushed with dill pollen butter as soon as they came out of the oven. The plain loaf went well, but the dill pollen loaf was gone in a flash. This bread is awesome for sandwiches and toast. We just had it at work simply spread with veggie cream cheese. Add a slice or two of garden fresh tomatoes and cracked pepper over the cream cheese spread rye and you have a heavenly lunch! Or a snack or breakfast; enjoy! Place the buttermilk, honey and yeast in stand mixer bowl. Add the rye flour and mix until moistened using the paddle attachment. Let the mixture sit for 30 minutes to hydrate the rye flour. Add the wheat gluten, bread flour, two tablespoons of the melted butter, salt, dried minced onion and tablespoons caraway seed. Mix at medium speed for about 6 or 7 minutes. Scoop out dough and place into an oiled 9”x13” plastic container. Cover it tightly. Let the dough rest at room temperature for 30 minutes. Now we’re going to do the first of three “stretch and folds.” I think our very own Donna Currie explains it quite well over on Serious Eats. You can also watch this video on YouTube of Peter Rheinhart demonstrating the technique. Wait 15 minutes after the first stretch and fold and then do it again. Repeat. After the third stretch and fold, cover the container tightly and place in the fridge overnight. The next day, pre-heat the oven to 475 degrees with a baking stone on the middle rack if you have a stone. Don’t worry about it if you don’t, the bread will still be wonderful baked on a sheet pan. Remove the dough from the fridge and let it warm up at room temperature for about 15 minutes. Divide the dough in half on a lightly floured surface. Shape into oval logs and place on a peel or a baking sheet dusted with cornmeal. Sprinkle caraway seeds over each loaf and press them in lightly. Slash tops of the loaves diagonally three times with a sharp knife. Cover the loaves with a clean tea towel or paper towels. Let them rise for 30 minutes. Slide the loaves onto the stone or place the baking sheet in the oven. After 5 minutes, turn the oven down to 400 degrees. Bake for 40-45 minutes or until the loaves sound hollow when you thump them. Remove from the oven. If you feel like some dill flavor, mix 1 teaspoon dill pollen with 2 tablespoons of melted butter and brush over the loaves. Cool. 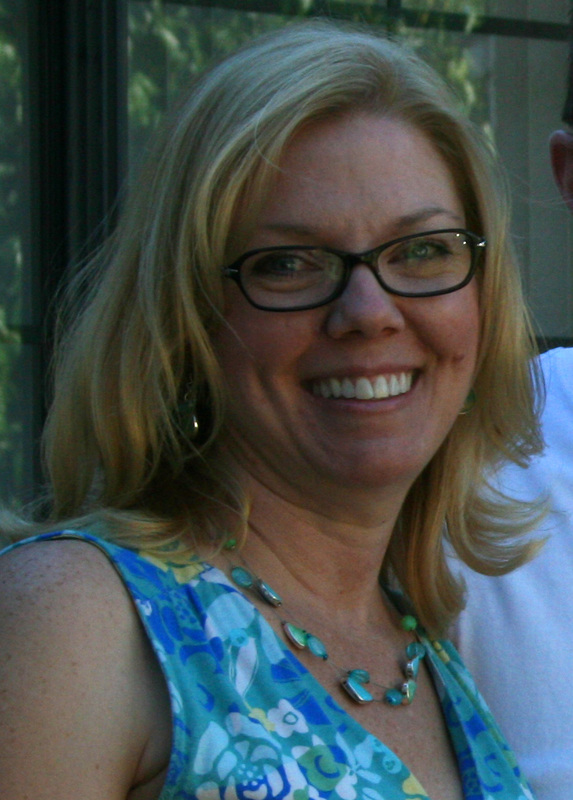 We'd like you to meet Susan W., who is also the sponsor of our bread challenge that starts today! Susan is not only a wonderful cook, she is also one of the volunteers that keeps everything running smoothly here at 37 Cooks. She's just recently joined the editing team, the Facebook team, and the photo editing team! Thank you in advance for all your hard work, Susan! 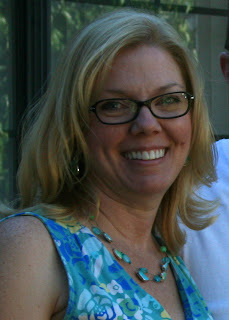 Hi all, I’m Susan Whempner, a homemaker from sunny Southern California. I enjoy quilting, photography, gardening and, of course, cooking (I especially love to bake). I've been married to my wonderful husband for 27 years and we have a 24 year old son, who will soon be a college graduate. When I was growing up, I’m pretty sure I viewed having to help out in the kitchen as an annoying chore. It wasn't until my mom went to work for my dad, who had his own business at the time, that I was put in charge of making dinner once in a while. I vividly remember the very first dinner I made. It was “Danish Meatballs” from a recipe I found in an old McCall’s cookbook. The meatballs fell apart while I was browning them, and my white sauce was a gooey, doughy mess. I served this awful thing to my parents because, in my mind, all the ingredients were there so how bad could it be, really? My dad actually managed to eat it (I think he felt sorry for me), but my poor mom just couldn't do it! To this day she and I still get a good chuckle over the meatball story. It wasn't until I got married and started cooking for my husband and baking for holidays that I realized how much I really loved to cook. I hope you enjoy all of the bread recipes coming your way from our 37 amazing cooks! 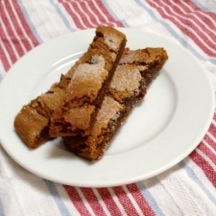 We are so happy to receive this recipe from Jenny, a friend of 37 Cooks! Inspired by my grandmother’s chocolate chip cookie recipe that I re-worked to be gluten-free. This is a recipe I’ve had and have been making for years. I do it by memory. Preheat the oven to 350 degrees. In a small bowl, whisk together the flour and baking soda; set aside. In the bowl of an electric mixer fitted with the paddle attachment, combine the butter with both sugars; beat on medium speed until light and fluffy. Reduce the speed to low; add the salt, vanilla, and eggs. Beat until well mixed, about 1 minute. Add the flour mixture; mix until just combined. Stir in the chocolate chips. Drop tablespoon-size balls of dough on a baking sheet, about 2 inches apart . Bake until the cookies are golden around the edges, but still soft in the center, 8 to 10 minutes. Store the cookies in an airtight container at room temperature for up to 1 week. Makes 3 dozen. I found this cookie recipe in a magazine a few years ago. I haven't changed the recipe at all because they're so pretty and delicious just the way they are. In a large bowl, cream the butter and sugar until light and fluffy, then beat in the almond extract. Combine the flour, baking powder and salt. Gradually, add the dry ingredients to the creamed mixture and mix well. Roll into 1 inch balls. Place 2 inches apart on an ungreased baking sheet, or use parchment paper. Coat the bottom of a drinking glass with cooking spray and dip the glass in additional sugar. Flatten the cookies with the prepared glass, dipping it in sugar again as needed. Bake at 400 for 7 to 9 minutes, or until the edges are lightly browned. Cool for a minute before moving to a cooling rack. In a small bowl, whisk together the powdered sugar, almond extract and enough water to achieve preferred glaze consistency. Tint with green food coloring if you desire. 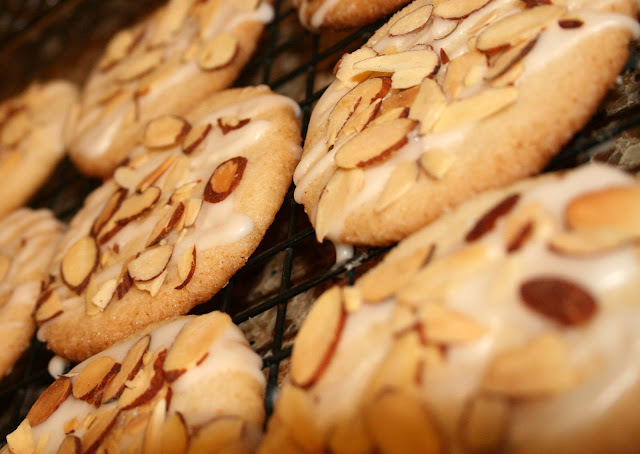 Drizzle glaze over cookies and sprinkle with toasted almonds. Makes about 4 1/2 dozen cookies. I don't have holiday cookie traditions. No tattered pieces of paper or index cards tucked away, scribbled with Great Aunt Peggy's or Grandmas faded handwriting. Truthfully, and part sadly, there isn't a lineage of recipes in my family. So, every Christmas, I make a different cookie recipe. Several ones, even. I say I like to just keep it interesting but, in part, I think I'm secretly searching for a recipe to make my own. One to pass down to my own children some day. Of all of the cookies I've made over the past decade, this is one of those recipes that I could see making with grandchildren. And I have The Food Network Magazine to thank for it. Toast the pecans in a medium skillet over medium heat, stirring, about 5 minutes. Transfer to a cutting board; let cool, then coarsely chop. Line 2 baking sheets with parchment paper. Toss the pecans and cornflakes in a large bowl. Make the caramel: Bring the butter, cane syrup, heavy cream and salt to a boil in a medium saucepan over medium heat and cook, stirring with a wooden spoon, until the mixture pulls away from the sides of the pan and comes together into a loose ball, about 5 minutes. Remove from the heat. Once the caramel stops bubbling, stir in the semisweet chocolate until melted. Pour the chocolate caramel over the cornflake mixture and toss to coat. Scoop heaping tablespoonfuls of the mixture onto the prepared baking sheets and pack into compact mounds with your fingers. Let set, about 1 hour. These cookies have a long history in New England, where precious stores of them were packed away in sea-chests aboard Clipper ships. They will last for months if kept in an airtight container, and the flavor improves with age. May be doubled. Unbaked logs of dough may be stored, well wrapped, in the refrigerator for a week. Heat oven to 375º F. Line a cookie sheet with parchment paper. Cream the butter and sugar until light & fluffy. Add the egg and mix well, then add molasses and mix again. Add the dry ingredients and raisins, and mix slowly until the dough comes together. Divide the dough in half. Shape each half into a log about 1 1/2” diameter and about 12” long. Put on single cookie sheet with three inches space left between - if your cookie sheet isn't that large, just use two. Sprinkle the tops of the logs heavily with granulated sugar. Bake about 18 minutes, until puffy but still soft in center. Let cool, cut crosswise into bars, and store in an airtight tin. We have a tradition of baking cookies with our friends on the weekend following Thanksgiving. The kitchen is filled with cookies in all stages from dough to cooling racks. There's a crowd around the table decorating the cut-out teapots and hedgehogs. We always include this particular cookie, which is a favorite for the taste, for the simplicity, and for the wonderful oddity of frosting the cookies before baking them. In a large bowl, cream the butter. Add the sugar and beat until fluffy. In a separate bowl, stir the flour, baking soda, and salt to combine well and aerate. Add the egg and both extracts to the butter and sugar, mix thoroughly. Add the flour mixture, beating well. Chill the dough, wrapped, for several hours (or up to three days). At baking time, preheat the oven to 375º F. Divide the dough into 40 pieces, and shape each one into balls about 1 inch in diameter. Place about 2 inches apart on parchment paper lined cookie sheets. Make a deep thumbprint in the center of each ball. Put a drained cherry in each hole. In a small saucepan, combine the chocolate chips and the condensed milk, and stir over low heat until the chocolate is melted. You can also use a microwave on about 70% power. Add about 4 teaspoons of the reserved cherry liquid. Spoon 1 teaspoon of frosting over each cherry, covering it completely. Bake for about 12 minutes, until the cookies are pale brown just at the edges. They keep well in an air-tight tin, that is, if your family will leave them alone. I've had this recipe for a while. I do not know where I got it. I think my aunt passed it to my mom, but I'm not 100% sure. In a large bowl, cream the butter and brown sugar until light and fluffy. Beat in the milk. Gradually, add the crumbs and mix well. Stir in the chips and walnuts. Fill miniature foil baking cups three-fourths full. Place 1 inch apart on baking sheets. Bake at 375° for 10-12 minutes, or until set. Cool on wire racks. Top each cookie with 1/4 teaspoon of melted chocolate. Store in the refrigerator. 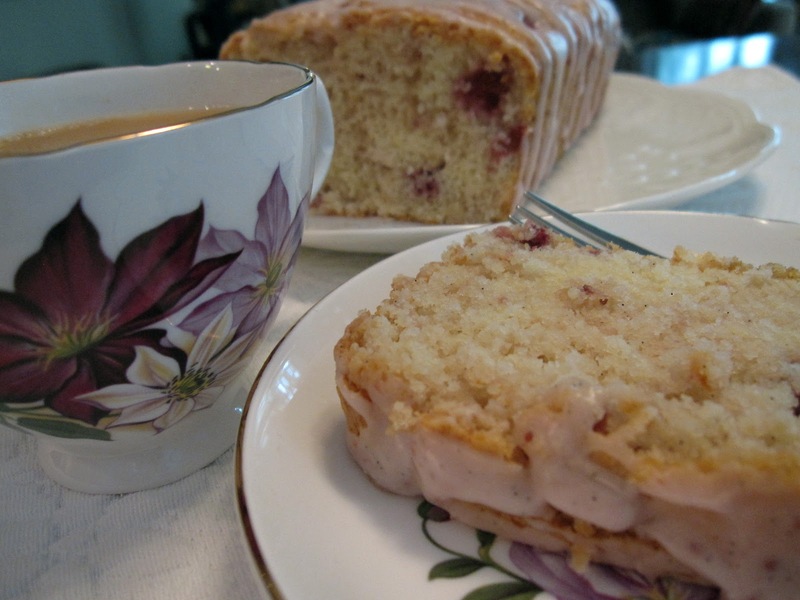 This recipe originally came from Uncle Butch’s mother back in 1946 or ’47. Uncle Butch was my grandma’s brother-in-law. However, I associate them most with my Grandma Stella, and have thus given her the credit. Mix all ingredients using a pastry blender or stand mixer. If you’re using a stand mixer, you may want to do this in two batches. Finish with your hands if necessary. Roll into small balls about the size of a marble or small cherry. Resist the temptation to make larger balls and thus hasten completion of the job. Place all the balls in a bowl, cover, and refrigerate overnight. I've refrigerated them for several hours and it worked well enough. Mix all ingredients to make a paste. Add a bit more milk if it’s too thick. You can make this a day ahead as well, but to facilitate spreading, it should be room temperature when you actually make the cookies. The next day, working with a friend if possible, remove about six balls of dough at a time from the fridge. Roll each ball in powdered sugar and flatten with the palm of your hand. Roll them out very, very thinly on a powdered sugar-covered board. Spread out a very thin, almost transparent, layer of the nut filling and roll them into a log. Bend to form a crescent shape. This works best if one person rolls out the dough and another spreads the filling. Place the cookies on an ungreased cookie sheet and bake at 350 degrees for about 15-20 minutes, until golden brown. Sprinkle with sifted powdered sugar before serving. These cookies ship and freeze beautifully. 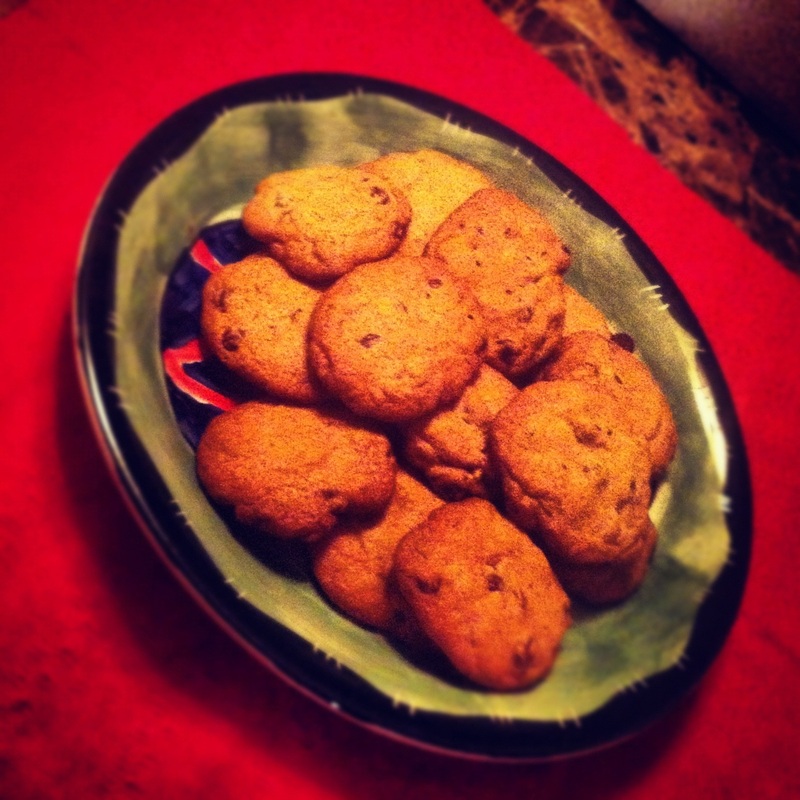 The recipe does make a LOT of cookies (upwards of 12-14 dozen), so beware. Feel free to cut the recipe in half, or in quarters, or just plan on making a night of it. We've never cut the recipe in half though. They're just that good! I proudly admit to loving fruitcake but before any preconceived notions are formed, these cookies bear none of the heaviness or day-glow fruit of their namesake. Vary the fruit to your taste. See end of recipe for my adjustments. Snip off the hard stems of the figs with scissors or a small knife and coarsely chop the figs. 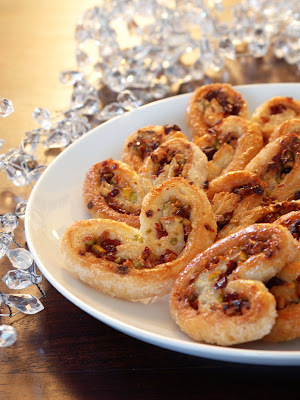 In a medium bowl, combine the figs, raisins, cherries, apricots, honey, sherry, lemon juice, pecans, and a pinch of salt. Cover with plastic wrap and allow to sit overnight at room temperature. In the bowl of an electric mixer fitted with the paddle attachment, cream the butter, cloves, superfine sugar, and brown sugar on medium speed until smooth, about 3 minutes. With the mixer on low speed, add the egg and mix until incorporated. With the mixer still on low, slowly add the flour and 1/4 teaspoon of salt just until combined. Don't over mix! Add the fruit and nuts, including any liquid in the bowl. Chiffonade's cookie dough prepped and ready to freeze and bake. Divide the dough in half and place each half on the long edge of a 12 by 18-inch piece of parchment or waxed paper. Roll each half into a log, 1 1/2 to 1 3/4-inch thick, making an 18-inch-long roll. Refrigerate the dough for several hours, or until firm. With a small, sharp knife, cut the logs into 1/2-inch-thick slices. Place the slices 1/2-inch apart on ungreased sheet pans and bake for 15 to 20 minutes, until lightly golden. Note: I used chestnuts for the figs and dried fruit for the glacé fruit in the recipe. I tossed the fruit with brandy (not sherry), omitted the honey and lemon juice and did not do the overnight steep. The fruit I used was naturally very moist. I used granulated sugar vs. superfine sugar with no ill effects. I felt that the amount of ground clove would be overpowering and used ¼ teaspoon nutmeg, ¼ teaspoon ginger and ½ teaspoon cinnamon. The cookies had a lovely aroma. Spread 1/2 cup of sugar on a baking sheet. Place one sheet of puff pastry on the sugar, then sprinkle 1/4 cup of sugar on top of the puff pastry. Roll out the puff pastry into an 11" x 11" square, so that the sugar is pressed into the pastry. Chop the cranberries and pistachios together (the slight stickiness of the cranberries keeps the pistachios from spreading too much). Spread out half of this mixture on the puff pastry. Fold one side of the pastry halfway towards the middle, and do the same with the other side. Fold each side again so that they meet in the middle. Finally, fold one half over the other. Repeat with the second sheet of puff pastry. With a sharp knife, slice the pastry into 3/8" slices and place on a baking sheet lined with parchment paper or a Silpat. Be sure to leave space between each, as the puff pastry will expand outwards as it bakes. Bake for 7-8 minutes or until the sugar on the bottom is golden and caramelized. 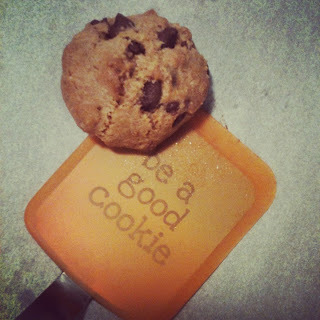 With a thin turner or spatula, flip the cookies over, then bake for another 4-5 minutes. Remove to a cooling rack and let cool completely. The house is a wreck. The fridge is still full of Thanksgiving leftovers. We have expected and unexpected house guests arriving and departing, and kids home from college and then leaving to go back. We've pulled out the Christmas decorations and even the artificial Christmas tree that is so old, I don’t remember when we bought it. There are needles all over the floor, so the shop vac is in the house, too. There are piles of extension cords, a pile of Christmas lights that don’t work, and a more organized pile that does, empty boxes that need to go back downstairs, and full boxes (improperly labeled) still to be unpacked. Two trees are partially up, but not well fluffed and the uneven lights need some work. The cheap indoor light timers and the massive-looking outdoor light timers are on the couches and floors, and yes, the house is complete chaos! Willie and I love it. The noise, and the mess, and the food, and just everything. My step-daughter, Shelby, made my mother’s shortbread last night and filled up the two-tiered cookie dish with them before she left. I decided to wait to photograph them in the morning, when I had some nice morning light. That was a mistake! Willie stayed up late last night to watch that quintessential Christmas movie…Pulp Fiction. He ate a few cookies. We make these cookies every year. Everyone loves them, and Christmas is not complete unless several dozen are made and consumed by us, several more dozen made and given away to friends and neighbors. They melt in your mouth and they cannot be mailed no matter how carefully they’re wrapped. Too delicate. This is a recipe my mother learned in a cooking class in British Columbia as a young woman. I actually had no idea where the recipe came from until Shelby asked me. I’d always assumed this was a recipe handed down through the ages from my Canadian mother, her Swiss mother, and so on. My mom will tell you the secret to this recipe is “all in the whipping”. The instructions include whipping for 10 minutes. If you have a Kitchen Aid, just set the timer. Otherwise, take turns holding the hand mixer so your arm doesn't get tired! Preheat the oven to 325 degrees. Place all ingredients in a mixing bowl and whip for 10 minutes. Don’t skimp on the whipping, it’s the secret to the cookie. Place the dough on an ungreased (I use parchment paper!) cookie sheet, about 2 inches apart. The cookies will end up being about 1 ½ inches in diameter so use that as a guide for how much dough to drop on the sheet. Place in oven for 10 minutes. The cookies retain their white appearance so don’t overbake them. Let them cool on the sheet for about 5 minutes before removing them to a wire rack. This helps them to keep their shape; they are delicate and break easily. Personally, I think these cookies just don’t taste right unless there is a quartered red candied cherry on top. 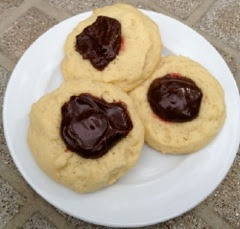 I can’t stand these cherries in any other recipe on Earth, but they taste great on shortbread. If you choose to put cherries or nuts on your cookies, do so before they go into the oven.